If you’re a veteran, it is our honor to provide you with the very best in customer service. We’re here to help you get the best cannabis products at a great price. Which is why The Dispensary NV proudly presents this special offer just for you! Here at The Dispensary NV, we are proud and grateful of all the men and women who serve this beautiful country. Whether you are a retired member of the armed forces, or you are currently enlisted, our company would like to thank you for your sacrifices and bravery. 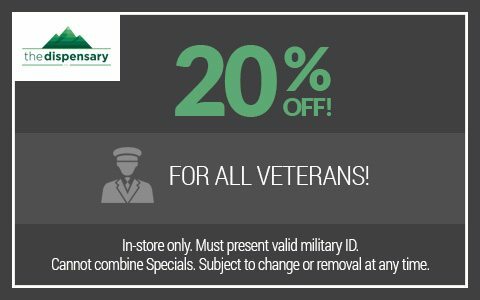 Present your military ID and this coupon when you checkout at our stores, and you will receive 20% off your purchase price. Browse our menu online beforehand, or pick and chose once you arrive. You are our guests, and we are happy to help in any way we can. Our knowledgeable team will gladly assist you in choosing the best items to suit your individual tastes and needs. If you’re planning a night out on the town — perhaps to the casinos — it’s important to know smoking marijuana is not legal in public places in Nevada. But our edibles can provide discreet, legal entertainment! If you’ve been injured in the line of duty, suffer from depression or sleeplessness, or have any other aches and pains, our products can help alleviate your discomfort. Cannabis products can be enjoyable, and can also have a wide variety of medical benefits. When you are ready to purchase your desired cannabis products and accessories, head to The Dispensary NV. Whatever it is you’re in the market for, and for whatever reason, The Dispensary NV will have what you’re looking for at a location near you. Come shop with us. Let us thank you for your service. This offer is only available to our veterans. For any questions about our products, this discount, or cannabis laws in Nevada, view our FAQ page online or speak with a member of our team today! We look forward to your visit and we thank you for all that you and your family have given in the name of freedom.